*D_NUMB NODE_P NODE_N MODEL AREA IC=? TEMP=? *Q_NUMB NCOL NBASE NEMIT NSUB MODEL AREA IC=? TEMP=? *MOS_NUMB NDRAIN NGATE NSOUR NBULK MODEL L=VAL W=VAL AD=? AS=? PD=? PS=? 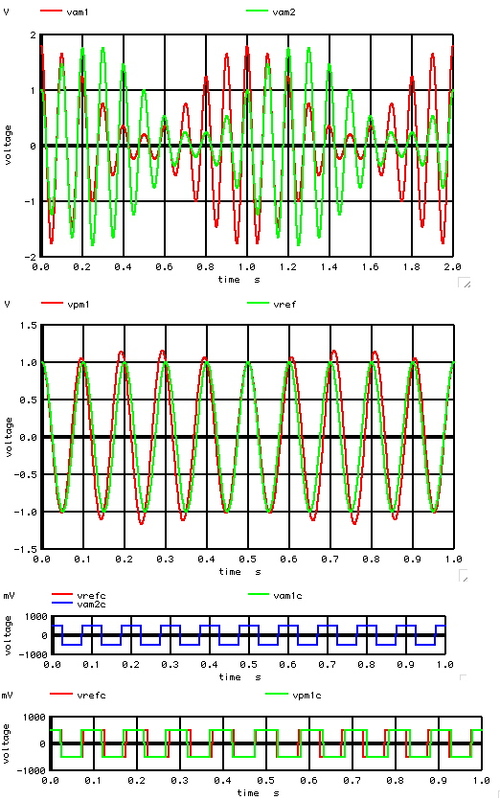 *JFET_NUM NDRAIN NGATE NSOUR MODEL AREA IC=? TEMP=? *R_Rsemi# N1 N2 VALU MNAME L=? W=? TEMP=? *AC DECLin NUMDEC FSTART FSTOP TRAN TSTEP TSTOP TSTART TMAX ?UIC? *TRAN TSTEP TSTOP TSTART TMAX ?UIC? *specwindow none, hanning, cosine, rectangular, hamming, triangle, bartlet, blackman, gaussian. and & or | not ! 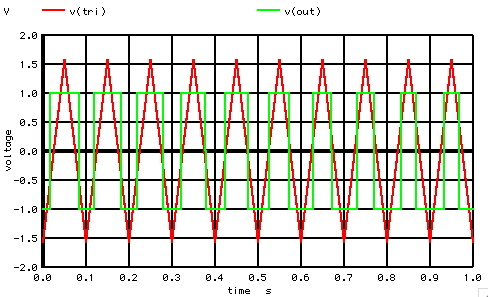 .OPTIONS SRCSTEPS =100 100 is the number of steps of stepping algorithm. .OPTIONS GMINSTEPS =200 Gminsteps option adjusts number of Gmin increments used during DC analysis. .OPTIONS METHOD =gear default is "trapezoidal" (or just "trap"). 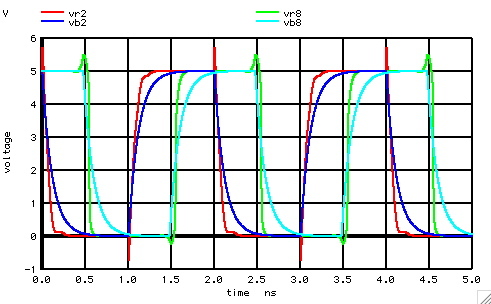 .OPTIONS VNTOL =1m sets accuracy, default Vntol=1µV. 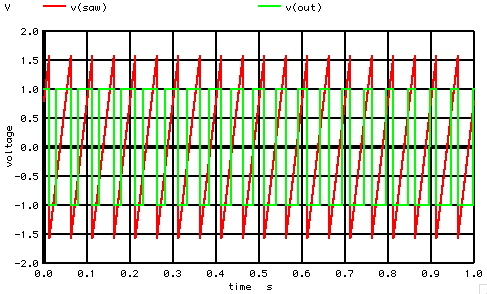 .OPTIONS TRTOL =x Sets transient error tolerance. default 7.0. an estimate of overestimates truncation error. 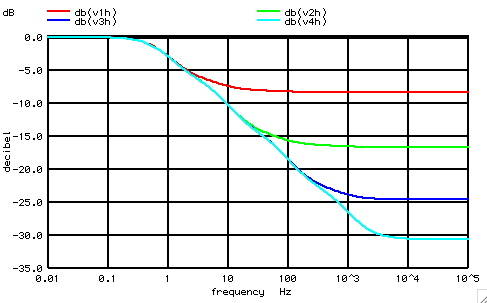 .OPTIONS ITL1 =400 dc iteration limit. default is 100. 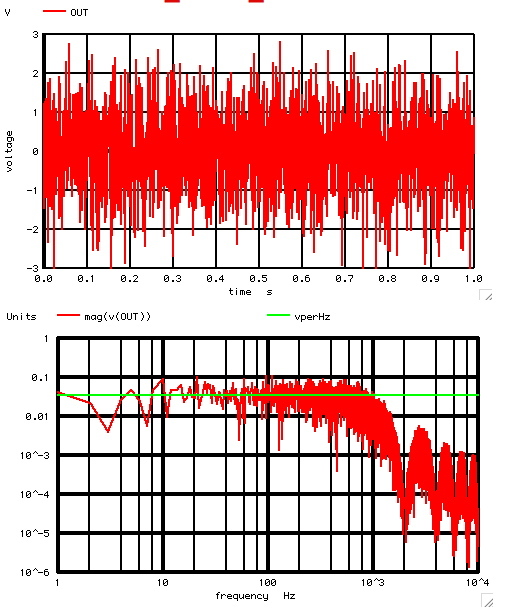 .OPTIONS ITL2 =100 dc transfer curve iteration limit. default 50. 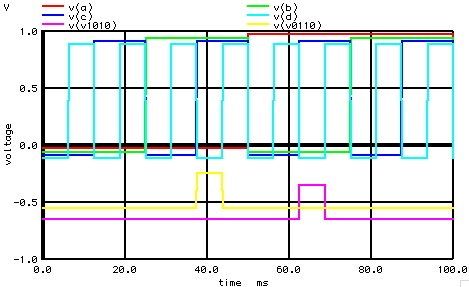 .OPTIONS ITL3 =x lower transient analysis iteration limit. default 4. (Note: not implemented in Spice3). 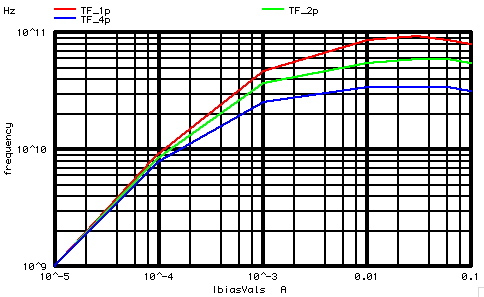 .OPTIONS ITL4 =500 transient analysis timepoint iteration limit. default is 10. 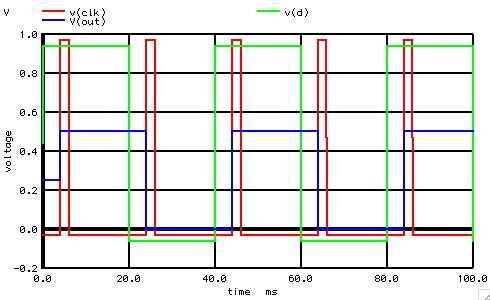 .OPTIONS ITL5 =x transient analysis total iteration limit. default 5000. Set ITL5=0 to omit test.not in Spice3. .OPTIONS PIVREL =x Resets relative ratio between largest column entry and an acceptable pivot value. 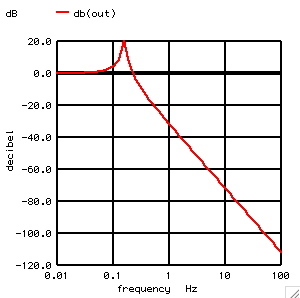 default 1.0e-3. .OPTIONS PIVTOL =x Sets absolute minimum value for matrix entry to be accepted as pivot. default 1.0e-13. 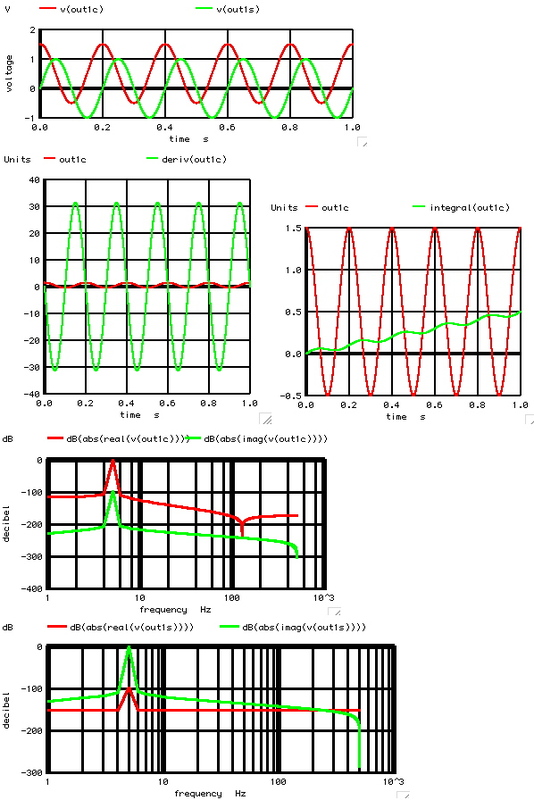 .OPTIONS RELTOL =x Sets the relative error tolerance of the program. Tdefault value is 0.001 (0.1%). 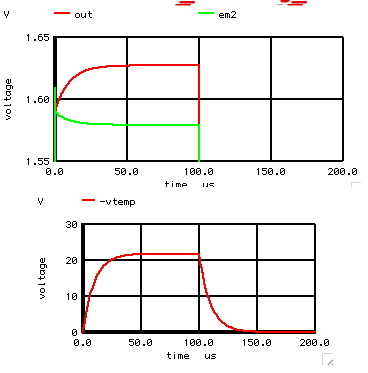 .OPTIONS TEMP =x Sets operating temperature of the circuit. default s 27 deg C (300 deg K). Add RC snubbers around diodes. Add rise/fall times of the sources. starts with everything at zero unless specified with .ic statements. safer to use a .IC statement and not specify UIC on the tran statement. Logic gt > lt < ge >= le <= ne <> eq = and & or | not ! 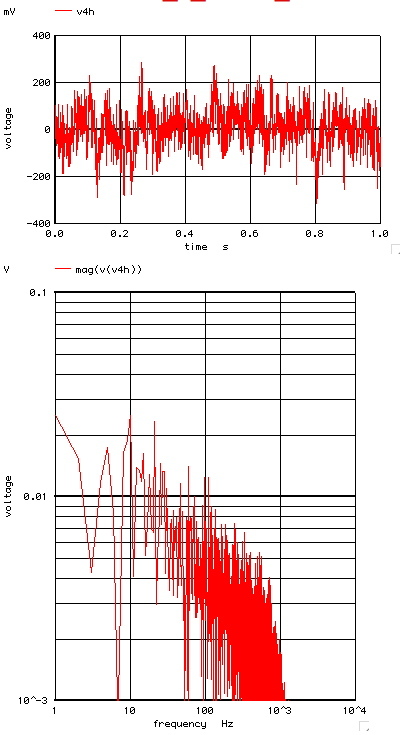 j(vector) i (sqrt(-1)) times vector. real(vector) real parts of vector. imag(vector) imaginary parts of vector. 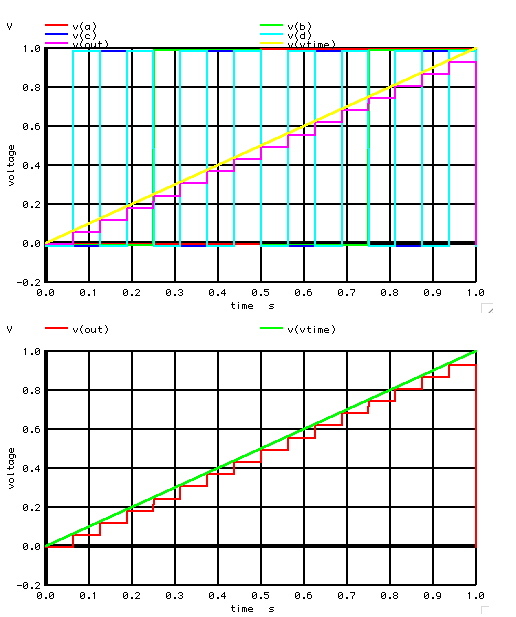 log(vector) logarithm (base 10) of vector. 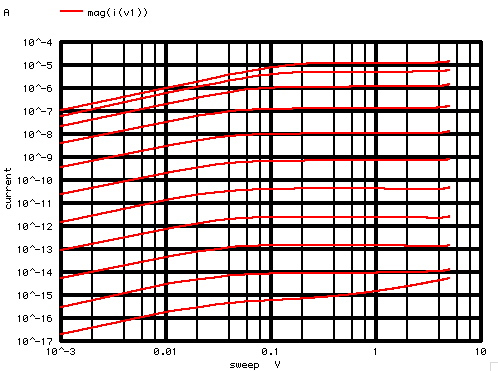 ln(vector) natural logarithm (base e) of vector. 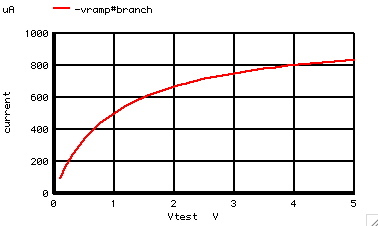 exp(vector) e to the vector power. abs(vector) absolute value of vector. sqrt(vector) square root of vector. acos(vector) inverse cosine of vector. 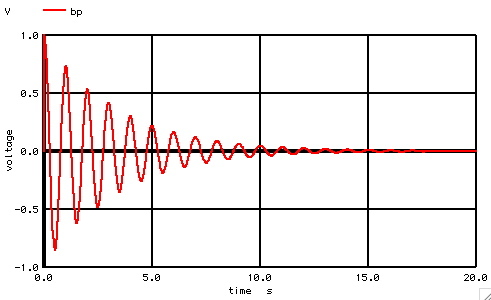 asin(vector) inverse sine of vector. atan(vector) inverse tangent of vector. 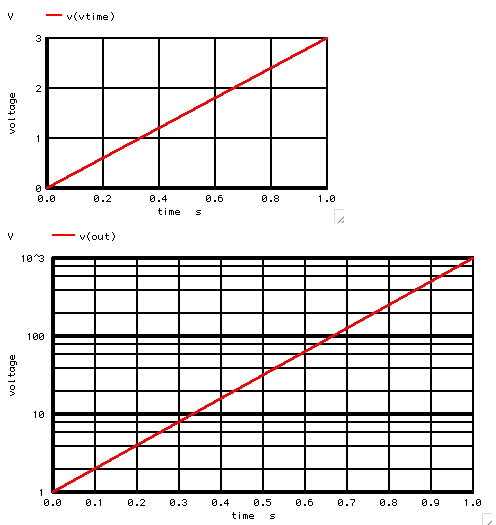 norm(vector) vector normalized to 1 (i.e. the largest magnitude of any element is 1). pos(vector) 1 if the real part of vector is positive, 0 otherwise. rnd(vector) random integer between 0 and absolute value of vector's corresponding element. mean(vector) a scalar (length 1 vector) mean of the elements of vector. 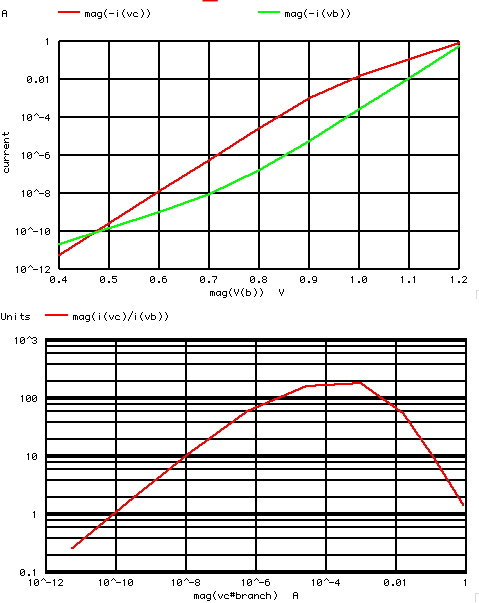 maximum(vector) maximum element of vector.with the greatest magnitude. minimum(vector) minimum element of vector.with the smallest magnitude. vector(number) result vector of length number If number = vector then = first element taken, floor used. length(vector) The length of vector. 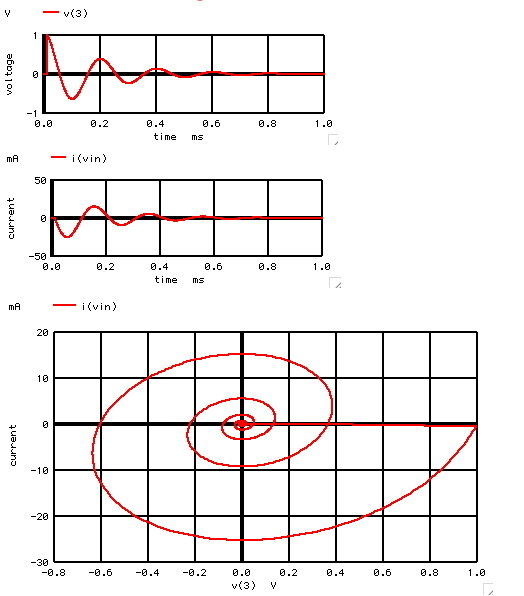 interpolate(plot.vector) result named vector onto scale of current plot. deriv(vector) Calculates derivative of the given vector. 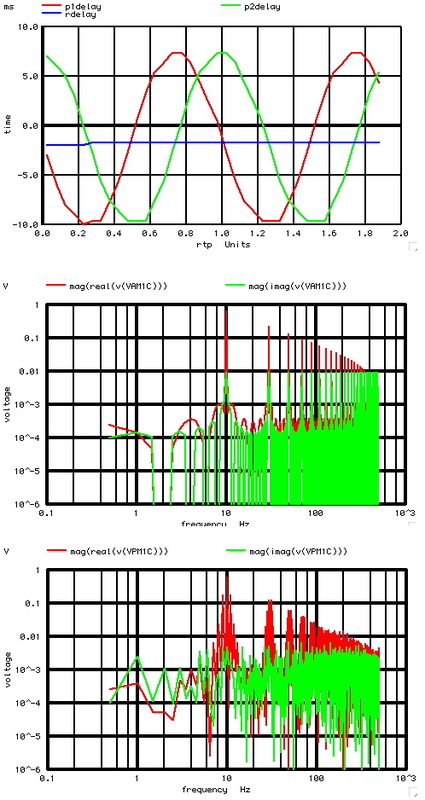 integral(vector) Interpolates its argument onto the current scale. Warning: Out of range index (-1), reset to 0. 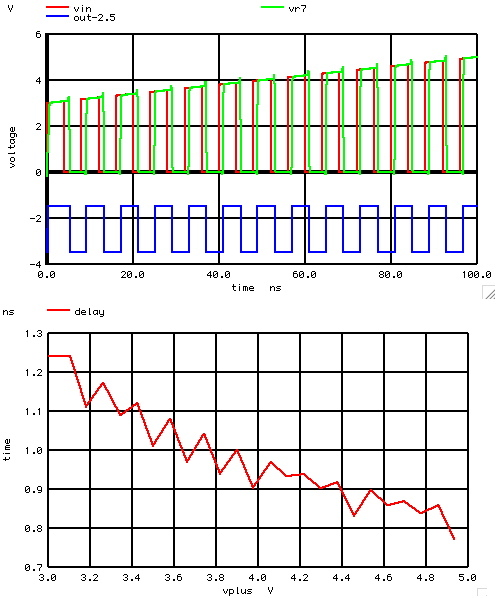 * the spectrum output appears to have..
echo "usage - rndsrc timestep duration"
echo "effect - gaussian source written to file -- $outfile"
echo "PWL_File.inc has been created in the MacSpice folder"
Warning: Source 'vpwlt' has no DC value specified, transient time=0s value used. * _|_ \/ | "rndsrc" in the "MacSpice"
* / \ | folder inside "Doucments"
* \___/ /// window "rndsrc .5m 1"
* type into a MacSpice window => "rndsrc .5m 1"
* it will generate PWL_File.inc in this format..
echo "3dB point = $&f Hz"
* 1.2fF ___ |40fF|| _V_ | CBS \(B)/SUB=gnd! echo "15um^2 Ftau vs IE and TF"
plot $NameList loglog title "15um^2 Ftau vs IE and TF"
echo "THD% versus VIN_vpk and Temp_C"
echo "$&j $&Tmp $temp $thisName "
* | . . . .
* | w=20um . 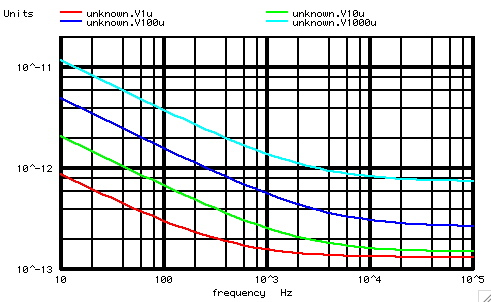 l = 1u . . .
* | . . 960mV . * | . 960mV . 840mV . * | . . 840mV . * | 960mV . . .
* | . . . 720mV . * | 840mV 720mV 720mV . * |960mV 720mV . . .
* |840mV . . . 600mV . * |720mV 600mV . . .
* | . . . 480mV . * | . 480mV . .
* |600mV 480mV . . .
* | . . 360mV . * | . 360mV . .
* | . . 240mV . * | . 240mV . .
* | 240mV . . .
* | 120mV . 0mV . * | 0| Use this to simulate Vbe and Beta over temp. * | _|_ Tweek the model terms IS, XTB, and XTI. * | / _ \ Repeat until simulations match actual silicon. 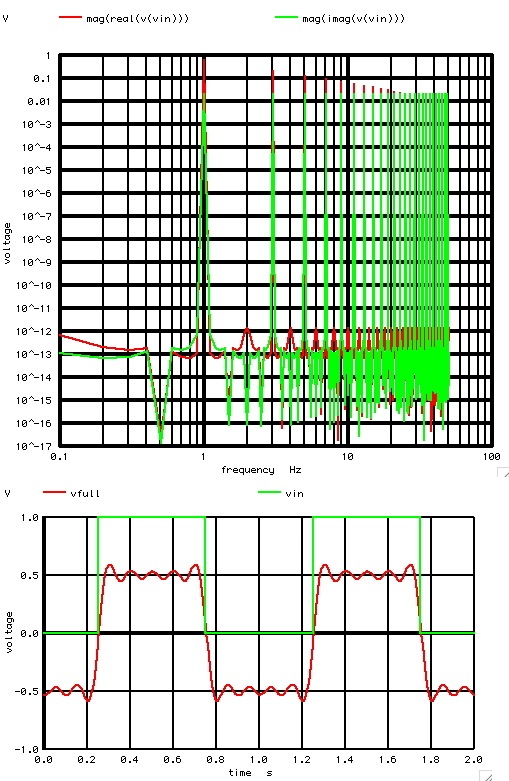 * _|_ \/ \/ Different simulators often give different results! 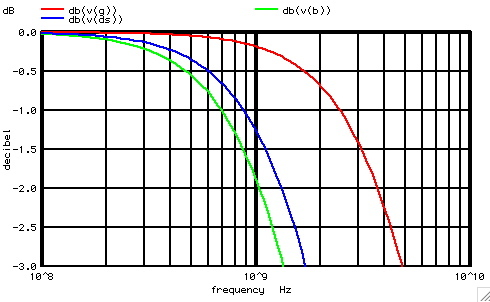 echo "3dB point f = $&f Hz cg = $&cg"
echo "3dB point f = $&f Hz cb = $&cb"
echo "3dB point f = $&f Hz cds = $&cds"
echo "cbs = cbd = $&cbs"
echo "cgs = cgd = $&cgs"
set pensize = N' where 0<N≤10 is measured in points. 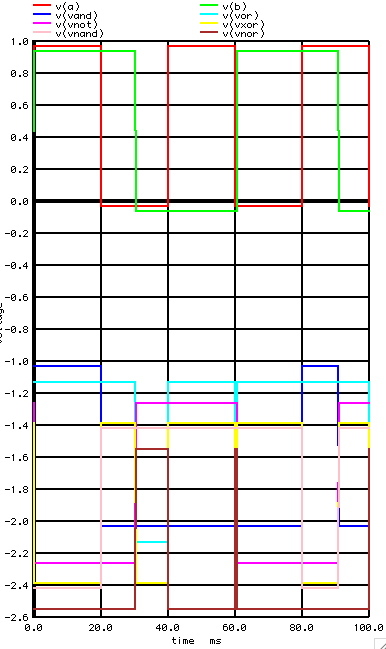 k and j are stored in 'unknown' plot created by the 'setplot new' command near the top of the file. 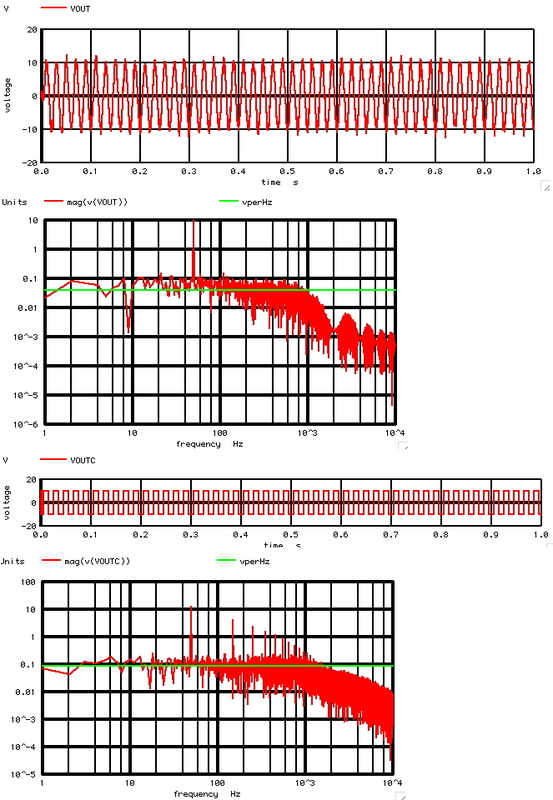 one destroy removes the "spec" plot leaving the linearized plot as the current plot. to get back to the 'unknown' plot. 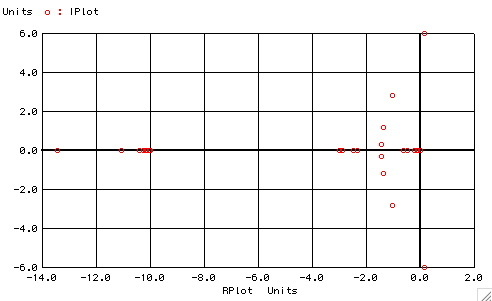 can refer to variables in non-current plots by specify the plot when referring to them. e.g. 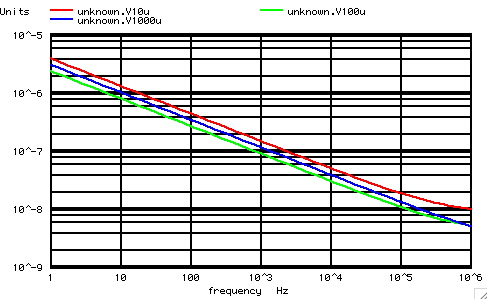 let unknown.k = unknown.k + 1 refers to k in the most recent unknown plot. when the variable is evaluated, respectively. If $foo is list, then the expression $foo[low-high] represents a range of elements. reverse of a list may be obtained with $foo[len-1]. $#foo evaluates to number of elements in foo if a list, 1 if a number or string, and 0 if boolean variable. "letter:subckt:", "#modelname", ":subckt:#modelname", or "letter:subcircuit:#modelname". TC1 First order temperature coeff. TC2 Second order temperature coeff. 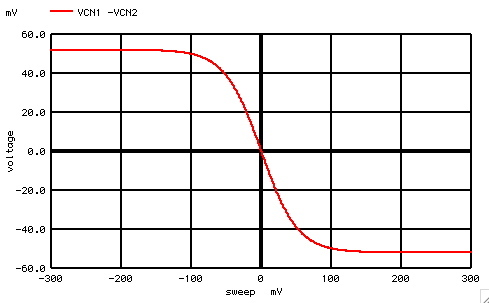 VALUE K coupling coefficient 0 -> 1. 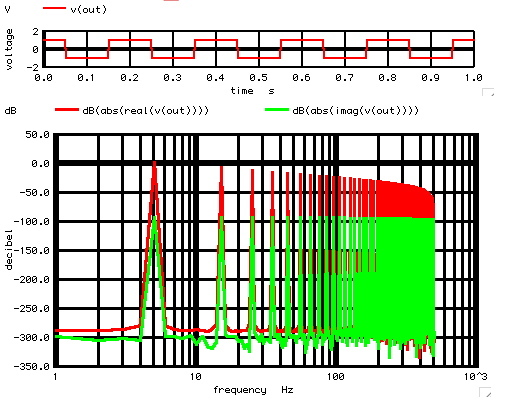 'dot'convention, place 'dot' on first node of each inductor. 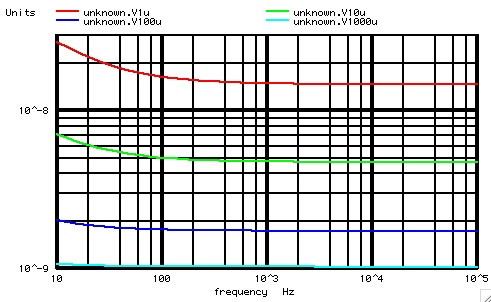 OFF indicates an (optional) initial condition on the device for dc analysis. * | | | / _|_ _|_ \/ \/ |gnd! AD,AS areas of the drain and source diffusions, in meter2 . 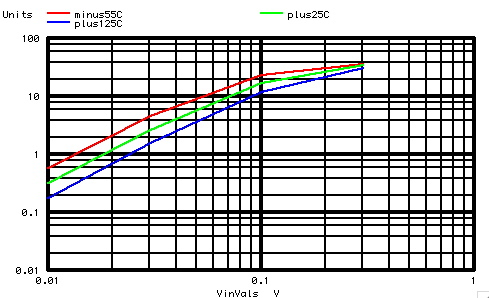 PD,PS perimeters of the drain and source junctions, in meters. MacSpice provides additional mosfet devices. 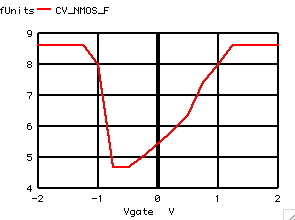 level 1 through level 3 MOSFETs are defined by the device parameters VTO, KP, LAMBDA, PHI and GAMMA. * .06fF ___ |2fF|| _V_ | CBS \(B)/SUB=gnd!